Salivary gland type tumors have been described in many locations of the body including the bronchopulmonary system. In the lungs, they are thought to arise from the minor salivary gland tissue of the tracheobronchial tree. Morphologically, histochemically, and immunohistochemically, these tumors share similar characteristics with their counterparts in the salivary glands; however, some differences have been observed in their histologic spectrum and biologic behavior. In addition, contrary to primary salivary gland tumors, the tumors arising in the lungs are uncommon, representing <1 % of all pulmonary neoplasms [1, 2]. Therefore, careful clinical and radiological investigations in patients presenting with a pulmonary salivary gland type tumor are essential to rule out metastasis from a salivary gland primary. The salivary gland type tumors known to originate in the lungs include mucoepidermoid carcinoma, adenoid cystic carcinoma, acinic cell carcinoma, pleomorphic adenoma, carcinoma ex pleomorphic adenoma, epithelial-myoepithelial carcinoma, and oncocytoma. 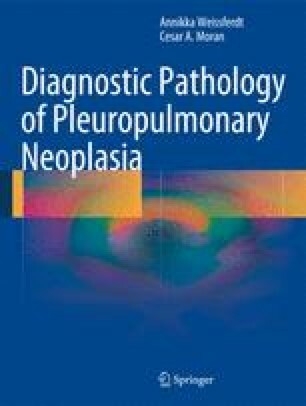 Another rare adnexal type neoplasm, sebaceous carcinoma, is also included in this chapter. The most pertinent histochemical, immunohistochemical, ultrastructural, and molecular features of these tumors are summarized in Table 6.1.